A missing convict, a young woman assaulted and killed, an old man murdered in his home. All in different parts of London. With eight million inhabitants, bad things happen to good people all the time. Only nine-year-old Cassie Janus knows there’s a connection, because she is the killer … in her nightmares at least. Cassie has the rare ability to unearth the darkest emotions of others. She sees a past they would rather keep hidden and a future too horrific to comprehend. Perhaps the killer can be stopped. If only she can make someone - her mother, her friend, her teacher - believe. Her words are dismissed, her sanity questioned. She knows they’ll believe her in the end … but by then, they’ll be facing death. Can she act to save them, or will their fate be left to Chance? I'm really getting spoilt with all of these gripping books I'm unable to put down and Chance is certainly one of those. The cover was a bit creepy and I wasn't sure how relevant it was to the story until I started reading. It reminds us that Cassie is a child who has had to grow up so quickly due to the things that she has seen and experienced, so it makes perfect sense to have Katie on the front. Aside from the murders, there are loads of tough topics covered in the book, including school bullying, child neglect, physical abuse and drug use. So there's an abundance of events to play with our emotions in between the killings. The story revolving around Cassie's mum, Leanne is exceptional. At the beginning of the book she couldn't care less about how Cassie gets home from school but she certainly turns into a lioness protecting her cub at the end. This turned my feelings for Leanne from exasperation to admiration - I really didn't think I could experience such a broad spectrum of emotions in one book, never mind for one character! I enjoyed the story of Laura Robinson, the social worker assigned to Cassie's case. Laura has struggled with her own problems, giving her the ability to empathise with every one of her cases. She really looks out for Cassie and goes above and beyond the call of duty. I held my breath (no pun intended) and gritted my own teeth during one of her scenes, I was so absorbed in the book! Cassie seeing and feeling the emotions of the killer was an absolutely brilliant idea for a book. Whether you believe in people having such an ability or not, we are left in no doubt that Cassie is experiencing some things that no 9 year-old should ever experience and my heart went out to her. Although I guessed who the killer was, I really didn't see the explosive ending coming. To say any more would spoil the story but you really must add Chance to your reading list and experience this rollercoaster for yourself. This is such a well-written, flawless book with an exceptional storyline that I would not hesitate to recommend it. 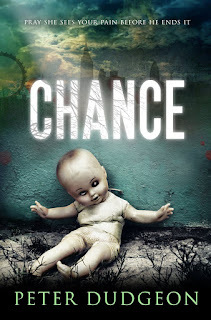 Chance is Peter Dudgeon's second book, I will certainly be adding his first book, Ticket, to my reading list.